An energizing scent of misty sea salt air with touches of grapefruit zest, tart yuzu and lime blossom. I’m always game for a fresh citrus scent so this candle was an easy purchase for me. As usual, the candle was gorgeous. 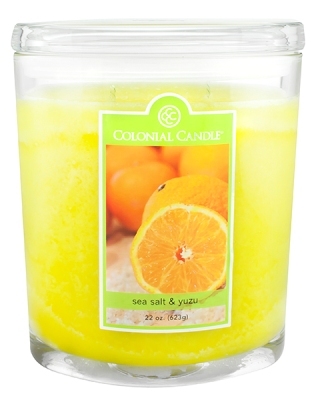 The color of the wax was a bright and happy yellow and the label on the candle showed sweet oranges. The vessel… oval and super heavy. You need two hands just to hold it. ? Okay, onto the fragrance. First impression, I’m pretty confident I smelled everything in the scent description. Yuzu, grapefruit and a hint of floral which I’m sure was the lime blossom. I even detected the fresh salty air. The overall scent was indeed fresh, and I couldn’t wait to light this candle up! I lit this candle in my master bedroom to start out and boy did it take forever to reach a full melt pool. 6 hours. The aroma… a very zesty fragrance with equal parts floral filled my bedroom. It was almost too zesty for my taste if I’m being honest. There was no sweetness to this scent and blended with the floral, it smelled kind of harsh to me. Maybe it was the salty air indicated in the description I didn’t care for? It smelled very “ozone” and from past experiences, ozone fragrances tend to come off harsh to me. Bottom line, this fragrance was not my cup of tea. Strength – this was very strong and filled my bedroom from corner to corner and then some. On a scale of 1 to 10 I would rate this candle a 10 in any size room. It was a definite room filler. This candle burned perfect. No wick issues. Clean burn from start to finish. One thing I like to point out with this brand, never trim the wicks prior to the first lighting. The wicks may seem too long but trust me when I say they taper down on their own. I learned that the hard way. Even though I personally didn’t care for this fragrance, I can still appreciate its other great qualities and still give it 5 stars. It was a gorgeous candle as are all Colonial large jars, it burned great and it was super strong. The scent itself did match the scent description, it just wasn’t my personal favorite. It happens. If you love floral scents or especially ozone type fragrances, I bet you would enjoy this candle. It was definitely more floral than citrus. Should you run across this when you’re out and about, smell it and see what you think.